It was mid April on the famed Davidson River. The Quill Gordons have been in full gear and the first hints of March Browns were beginning to flutter about. Accompanied by the sounds of rising trout and the ambient noises of the surrounding cove hardwood forest, the river was gurgling and churning as it should this time of the year. Spring has sprung. Trout and anglers alike know it. Big Creek, GSMNP in mid May. Fly fishing during the Spring time months can be spectacular. Still, it has its challenges. 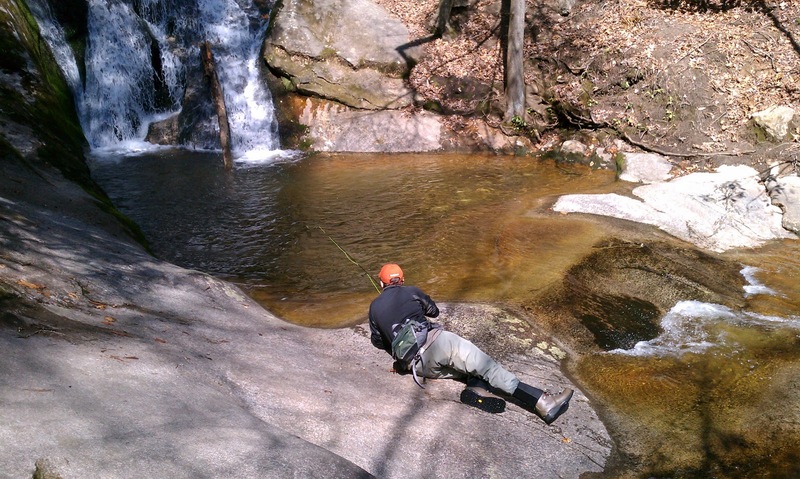 With gradual warming temperatures, trout begin to move around. After a long and cold winter, fish are ready to start filling up on larger and more plentiful insects that are rarely available in the winter months. Here in the southeast, particularly North Carolina, Virginia, Tennessee, and north Georgia, early March marks the emergence of the first major hatches of the year. The Quill Gordons and the Blue Quills being the major hatches. Generically speaking, a trout stream needs to reach 50 degrees for at least several days before the Quill Gordons start to really make a move to the surface. 50 seems to be the magical number. The Quill Gordons have been hatching for quite some time now here in WNC. During a hatch, the insects are swimming from the bottom of the stream, riding with the current, while propelling themselves to the surface. Trout will take these helpless bugs with reckless abandon. When you start seeing Quill Gordons on the water, tie on a Quill Gordon wet, let it sink to the bottom, and slowly inch it up to the surface when it nears your targeted fish. This sometimes results in vicious strikes, so hang on. Mid May Davidson River bow. As Spring rolls on, May brings with it a plethora of insect hatches. Hatches during the month of May include, bu are not limited to, Ephemerella Subvaria (Hendricksons), Stenonema Vicarium (March Browns), and the Stenonema Ithaca (Lt. Cahill). Other hatches worth mentioning include the Gray Caddis, Gray Fox, Yellow Midges, Sulphurs, Black Caddis, Green Drakes, Giant Stone Flies (Pteronarcys), and the BWO's (which never seem to rest). If you take a look at a WNC hatch chart, you will notice that May is the outlier in terms of how many insects hatch. Late March hosts far less hatching aquatic insects as opposed to May. Straying from aquatic insects, late Spring marks the beginning of terrestrial season. Hoppers, ants, beetles and eventually inchworms make their appearance in western North Carolina. If there isn't a hatch occurring, the best thing to do is tie on a nymph such as a Pheasant Tail or a March Brown Nymph. The absence of a hatch doesn't necessarily mean that a hungry trout won't tackle a lone dry fly, it just simply means that you will have more consistency catching fish nymphing. Mid April Mitchell River brookie. 1) Be aware of water levels. This time of year yields more rain, thus more water. Spring time in NC means severe thunderstorms. If you hear thunder or see lightning, stop fishing and wait for the storm to pass. Often, thunderstorms that occur well upstream will send water downstream in a hurry. 2) Fish the seams (where moving water meets slack water.) Trout are often found waiting in seams for passing food. They tend to sit in the calm, slack water, adjacent to the faster water, where food concentrations are higher. When a food item passes, they dart out into the faster water to grab the morsel before it gets away. 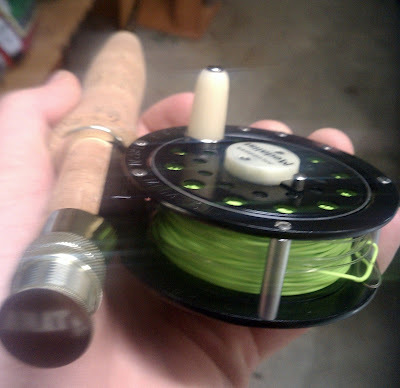 3) If the water is stained or muddy, use heavier tippet (2-5x depending on clarity of water). 4) 90% of a trout's diet consists of what they find below the water's surface,. 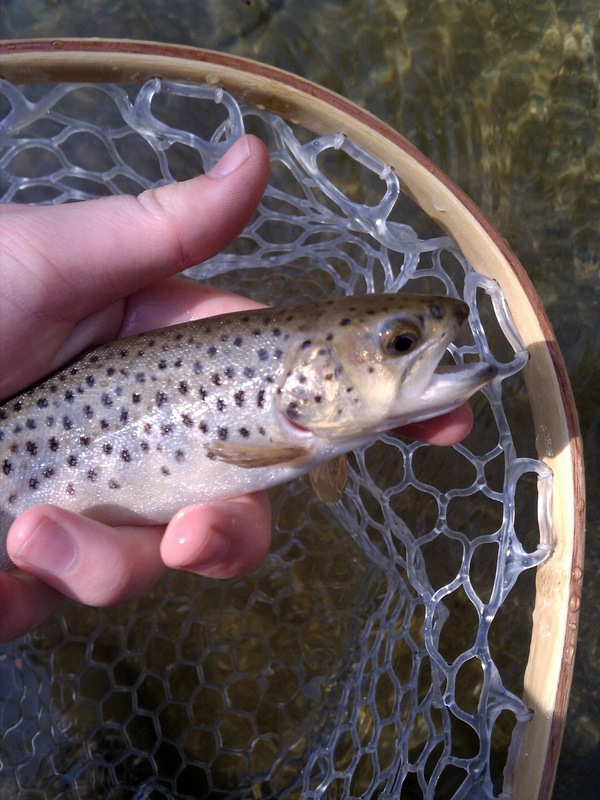 You are more likely to catch a trout on a nymph/wet vs. a dry in most situations. 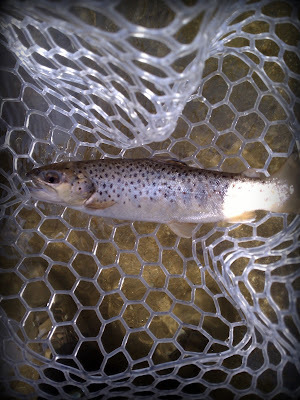 There are times when a dry fly works better, such as during a hatch. 5) Try a new fly that the fish have not likely seen yet. Also, try a smaller fly. If a #14 Parachute Adams doesn't work, switch to a #16 or #18. 6) In high, stained water during and after spring rains, use big #4 Zonkers, Woolly Buggers, and Zoo Cougars, large stonefly nymphs, etc. A bright red or pink San Juan Worm works as an excellent dropper in high water situations. 7) Most rainbow trout spawn in the early Spring, so try using an egg pattern. Spring in NC can be spectacular to say the least. Fishing is usually excellent with abundant hatches, warm temperatures, and plenty of hungry fish. Take advantage of the optimum weather conditions spring commonly offers! The short answer is yes. From an environmental standpoint, felt has a much greater chance of devastating an entire watershed by introducing non-native species. Most folks would agree that felt possesses more gripping capabilities than any other sole. The difference between the two in terms of gripping power and stability does not differ as much as one would think. On Sept. 14, 2008, Simms announced that they would phase out felt soles on all of its wading boots, sandals and shoes by 2010. Now, Simms has ousted their felt soled boots and replaced them with Vibram Technology. Simms teamed up with Vibram, a company headquartered in Albizzate, (in the province of Varese), Italy to produce Simms StreamTread soles. Vibram is well versed in developing some of the best soles for fisherman, hikers, rock climbers, watersports enthusiasts, and the such. I quickly discovered the difference between the two when I took the first step into a frigid and ice-laden South Toe River in late December. The amount of grip the Vibram soles offered was perfect. Treading over slippery rocks was a breeze. I have been wearing felt soles for as far as I can remember, so Vibram soles and I were just acquaintances. We're now best friends. Frankly, I was just awaiting the day my old Simms Freestones were worn out enough to make the switch to Vibram. On my most recent trip, I had the opportunity to really put the Vibram soles to the test. A short hike, and plenty of boulder hopping and climbing tested their capabilities. Walking up and down steep rocks was a snap. Felt soles are like Sea Lions. They're excellent in the water, but on land they have some issues. Felt will stick to the slipperiest of underwater rocks like glue, but when walking on land (especially on hills) you better be ready to catch your fall. If you're a big hiker who likes to hike into backcountry streams, Vibram soles are perfect. I'll push them to the limit when bluelining in the warmer months. So what's the big deal with felt? Invasive species. Didymo (Rock Snot), Whirling Disease, and New Zealand mud snails (just to name a few) are all capable of being transported from watershed to watershed through felt soles. They also can be moved to other watersheds via boats, waders, and other equipment that has come in contact with the river, stream, or lake. The soles on your boots come in contact with the river bottom much more frequently than any of your other gear. That means they have a far better chance of coming into contact with species such as Didymo, which thrives on the rocks you wade upon. To make things worse, felt is absorbent. Water will be absorbed deep into the felt, making it much harder to clean them. Within that water, harmful invasive species could be present. A stream bed covered in Didymo, or "rock snot." Albeit they're much easier to clean and maintain, always remember to clean your Vibrams and check for any hitchhikers. While felt transports invasive species more effectively, you're still not guaranteed to be hitchhiker-free when wearing Vibram soles. C) Hot water- soak for at least one minute in very hot water kept above 140° F (60° C) (hotter than most tap water) or for at least 20 minutes in hot water kept above 113° F (45° C) (uncomfortable to touch). D) Freeze the boots solid. Next time you upgrade to a new pair of wading boots, go with Vibram soles. I'm definitely sold soled. Who else has used Vibram soles? What do you think? Today is the last day of winter, tomorrow, at 7:21 PM, the first day of spring. To celebrate, I packed the gear into the truck and high tailed it to the mountains. 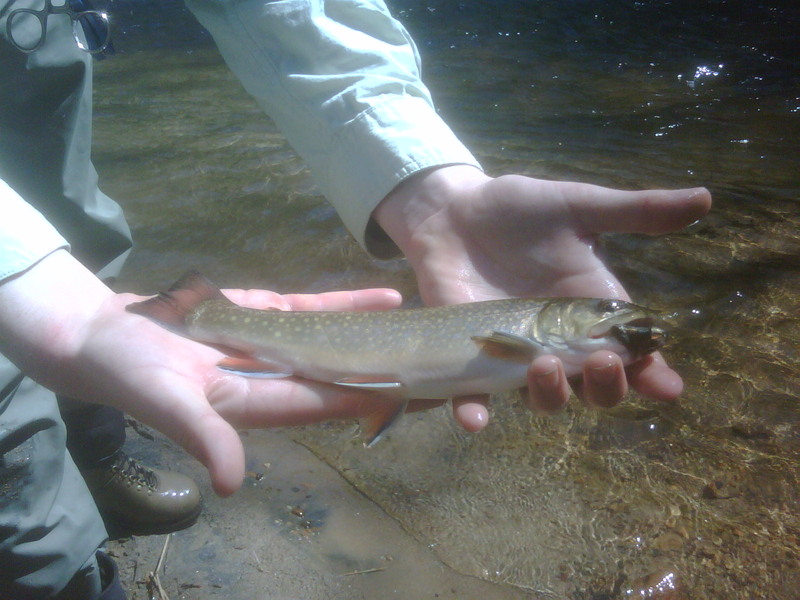 Initially, brookies were the planned target. One of my favorite WNC bluelines, which sits at about 4,500-5,000 ft, is slowly returning to spring. 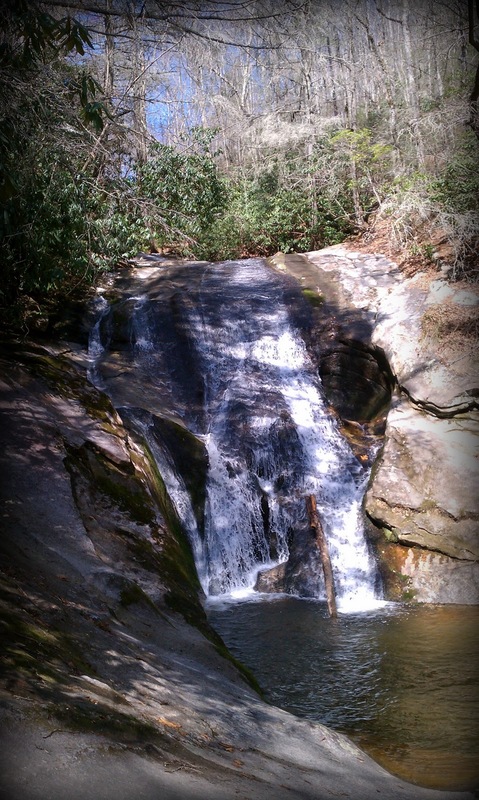 I decided to stay in the lower elevations and give the higher elevation wild streams time to rejuvenate. The brookies have had a long and harsh winter, but most of the time they're masters at surviving them. Stone Mountain was the destination. I was greeted to a deserted parking area on the East Prong, which told me the pressure has likely been somewhat minimal. Maybe everyone's at home watching the Madness (Go UNC!). The water was slightly higher than normal, but nothing substantial at all. You have to be familiar with the river to conclude that it's slightly above normal flows. It was clear as well. Fish were refusing flies on 5x, but took the same fly when I switched to 6x. Those fish being several browns. No rainbows, no brookies. The state has stocked much higher numbers of browns. They've also stocked much larger fish in some waters. Some of the trout that were stocked in Wilson Creek are in the upper 20's and even 30" range according to some credible reports. That is substantial. Even on the behemoth laden Davidson. I didn't see any fish that pushed 12" today though. The fish are spread out big time as a result of the heavy rain. Some pools contain a decent amount of fish, some don't. Fish that haven't spread out, will soon learn that they're no longer contained in concrete raceways. In addition to some decent fishing, the hatches were in full force today. Especially the Little Black Stones, which I'll probably find in my hair, in my shirt, and in the fly pack. They were relentless. The Blue Quills were hatching by late morning and then the Quill Gordons hatched after noon. Right now, the QG's are the big dogs. You can't miss them. They're like B-52 Bombers. #12 mayflies fluttering around like drunken bats. Funny to watch! Finally had the opportunity to test the new 2wt out. Who else took advantage of this picture perfect Saturday? Redfish, speckled trout, and stripers are now going to potentially be classified as gamefish here in the Tar Heel State. It's about time! Check out the article over at Capt. Gordon's Fishing Reports. Contact your state representatives and senators of NC to support this bill and launch it into action! Some of the best fishing we've seen since last November is about to unfold. All of the ingredients are coming together to make for one heck of a weekend. The weather report- Hang in there, the warmth is coming back. Tomorrow will be chilly and rainy, but we'll be rewarded with much warmer weather. A Southwest flow will take over later in the week. SW flow is fancy terminology for a SW wind that allows warm air from the Gulf, south, and southwest US to overspread the region. 77-80 is the forecasted temperature (depending on your source) for a high temperature Friday in Piedmont locales. The weather geek in me says we'll likely hit the lower 80s without much of a problem. If the weatherman forecasts a high of 78 and we reach 85, I doubt there will be many complaining. The mountains will be looking nice as well with highs approaching 70 in Boone on Friday and temps flirting with the mid 70s in Asheville. A cold front slightly cooler front, rolls in Saturday, but most won't even know it. The front drops Asheville's temps from 74 Friday to 67 Sunday. Both sound nice. Don't get me started on what the forecast suggests for next week. Not snow, you can breath now, but more warmth. I've got a growing feeling that the spring hatches (primary bugs being the Quill Gordons and Blue Quills) are about to explode very very soon. Could it be this weekend? Time will tell. Quill Gordons usually hatch in the early afternoon. Blue Quills will hatch from the morning hours to the early afternoon. Depends on the weather in some instances. Quill Gordon/Blue Quill dries, wets, and nymphs are going to be excellent choices out of the water. I would try a nymph in the morning. A #14-18 Pheasant Tail Nymph, Quill Gordon Nymph, or any other darker bodied nymph is perfect. Then, as you start seeing the first Quill Gordons/Blue Quills hatching, switch to a wet fly that imitates the bug. Trout will be picking off the mayflies darting to the surface to emerge. Drift that wet fly into the trout's feeding lane. Once the fly is near him, raise the rod tip up and let the fly rise to the surface. If a trout leaves bubbles after rising, he's eating a bug on the surface. Time to transition to a dry fly. If you head out in the coming days, enjoy! Tell us how you do. Enjoy the time change! Sure we lost an hour of sleep, but you gain an hour to fish after work! Ahh... The joys of spring. Speaking of spring, as the title of the post implies, spring officially starts in 6 days. Odds are your DH stream of choice has been stocked and is ready to be fished. The poachers came in, poached, and ran back up into the hills. We're used to it though. It's impossible to stop every single individual poacher, but you can report the individuals you stumble across. Make sure you're not calling the hotline within eye sight and ear shot of the poacher. He/she will book it if you are. Maybe, just maybe, a warden is in the area and is able to investigate the situation. It's never a good idea to approach a poacher. You never know when they are concealing a weapon. Calmly walk away and report the individual from a distance. You could saved an entire pod of trout from being poached just by making a call. Again, keep your fingers crossed a warden is in the vicinity. If you see any illegal activity (both on the water or in the woods), call 1-800-POACHER or 919-707-0003. If you see a warden, thank him/her! They spend countless hours patrolling the waterways and woods in order to protect and conserve wildlife that us outdoorsmen/women pursue. Poachers aside, the rivers here in WNC are still rolling. It looks like all water levels are above normal right now. We'll likely see above normal flows through the weekend. We didn't receive the amounts the NWS had previously forecasted, so it looks like huge flooding concerns were not immanent. There were mudslides though, leading to traffic headaches and more detours for travelers. If you do fish this weekend, bring the heavier tippet and the large flies. 4x should be perfect on most rivers. A Woolly Bugger, Zonker, Matuka, Zoo Cougar, or big streamer with a Pheasant Tail or San Juan Worm trailing behind will work wonders. Have fun and good luck! Stay safe, as the rivers are still high and swift. Up to 5" of additional rainfall is expected in some places of WNC tomorrow into early Thursday. A Flood Watch has already been posted for the mountain counties. Up to 5" of rain added onto an already saturated ground and swollen rivers is not a good thing. I fully expect a lot of rivers to look like the Davidson did 2 years ago after the remnants of a tropical system blew through. Fishing (or loitering in and around rivers) will be dangerous. As that Davidson River report shows, fishing can be done. Bring some common sense and a respect for Mother Nature if you do fish in those conditions. Remember, trying to wade in that water will either a) leave you without a pair of legs, as the current eats them, or b) the river skips the "leg appetizers" and eats you entirely. Okay, the river won't eat your legs, but it will sweep you away in a hurry. After all of that rambling, here's the conclusion: Get the ark up to speed and buckle up! Stay safe folks! The article below is from the Stop the Closure of National Fish Hatcheries Petition page. The federal government is planning to eliminate funding to nine Federal fish hatcheries in GA, TN, KY, UT, MO, ND, and AR, which will result in their closure. The closure of these hatcheries will have a lasting impact on local, State, and federal economies. These facilities also provide enormous ecological and social contributions to local and state communities. Nearly 7 million fish are stocked in waters across the country from only six of these hatcheries. The economic impact is tremendous - over 3,000 jobs created and a total economic output of nearly 300 million dollars is generated by privately owned businesses selling food, lodging and supplies to trout fishermen. For every dollar spent on these fishery programs a return of $67 dollars is generated in the private sector, and for each tax dollar spent producing trout, $2.34 is returned to Washington in federal tax dollars generated from private business. It is ironic that the Fish and Wildlife Service is celebrating the 140th year of their fisheries program; the oldest program in the agency. They are celebrating this historic event by cutting the entire fisheries program by 12.4 million dollars. They are getting a 47.9 million dollar increase in their overall budget, but have chosen to spend that money on other programs and new programs, and scrap a program that brings revenue into the federal budget at a 2.3 to 1 ratio and supports over 3,000 jobs in the private sector!!! DON'T LET THIS HAPPEN; STAND UP AND BE HEARD! Click here to sign the petition. I did, along with 397 concerned outdoorsmen/women and folks who don't want to see these hatcheries go. You're email is confidential, as is everything else (name can be anonymous). Currently there are no hatcheries on the list here in NC. Keep your fingers crossed NC isn't added to the list and the currently threatened hatcheries win the battle. Only YOU can prevent forest fires... err... I mean, the Feds from pulling the proverbial rug from beneath our feet! Just implemented a new social media tool to the blog. I've been waiting to push the button and activate it. Just never got around to it until now. Chatroll, which is a place for folks to, well, chat, is an excellent and easy tool. Click here to be directed to the chatroom or click the "THFF Chat" button in the menu bar. Feel free to jump in and talk fly fishing! I'll be on frequently. Rain is on the way and it won't be a dinky line of storms that are in and out in 2 hours. This will be one of those long, heavy, and soaking rain events. Just what the doc ordered to help cure us from this "sickness" we call drought. Flood watches are already hoisted for Ashe, Watauga, Alleghany, Wilkes, and Surry Counties. We'll see if the NWS extends the watches to bordering counties. Just because your county isn't under a Flood watch, doesn't mean you won't see plenty of rain. With that being said, Widespread 2" amounts in the mountains is looking promising. Amounts upwards of locally 4" is possible. 2-4" of rain will cause the rivers and streams to rise faster than you can convert those waist highs to chest waders. Water rises fast around here. Heavy rain upstream of your location can send water rushing downstream. Soft eddies turn to Class II rapids quickly. If you play it smart, fishing can be great when the water rises. Wading is not recommended in conditions like this as shallow, but swift water can sweep you off of your feet in a split second. However, if you find a calm spot on the river and you can clearly see the bottom, wading can be safely done. Just make sure land is a few steps away. Keep a keen eye on the water. If you notice it quickly rising, it's best to jump on land. Check the water levels either by selecting your sought after river in the menu bar above, or by clicking here to access a smorgasbord of additional streams and rivers. According to the latest data, the Davidson was sitting at 145 cfs 5 minutes ago. Now it's at 158 cfs. The D is rapidly on its way up. Back in December, the Davidson reached 3,000 cfs. Water levels of 1,000 cfs or more are not rare occurrences. With stained water and high rivers on the way, big flies are implemented. Carry the streamer box along with some large nymphs. A Zoo Cougar, Woolly Bugger, Muddler, Clouser, Zonker, Slumpbuster, Leech, or just about any other streamer should work very well for the next few days. A large, heavy Stonefly Nymph such as the Vinyl Rib Stone is an excellent choice. The 6x tippet is going to be pointless in most places. Heavier tippet in the order of 2x-4x (This is an angler's chance to catch a monster trout. If you've ever hooked up with a very large fish on light tippet (6x-8x) you know it's sizable task. Often times it's a task that isn't completed. Brown trout tend to bulldog you until they tire out or break off. Usually the latter comes first when you're dealing with a behemoth on light tippet. For the next few days, you should be able to bring big fish to your net without worrying about breaking them off. Have fun and keep an eye on those water levels! I've discovered a new widget that makes blogging easier. The shiny, sleek, new widget at the bottom of the screen is the popular Wibiya toolbar It sure is a life saver. The page seems to be loading a bit faster as a result of removing the Facebook widget. Instead of having the social network icons/widgets on the sidebars, they're now confined to the slim toolbar below. If you're a blogger or site owner, I highly recommend it! Click the "Facebook" button to like THFF or click the "Twitter" button to follow me on Twitter. That way, you can get "behind the scenes" updates, discussions, and ramblings. Feel free to post pictures, videos, fishing reports, comments, etc! Just another way to communicate with fellow fly anglers. If you're having trouble loading the page(s) let me know. Widgets such as the toolbar can sometimes cause slow loading times (or no loading at all). Sometimes switching to a different internet browser fixes those problems. I'm using Firefox and have never had any trouble. Good news and bad news. The good news is the fact that Meteorological Spring started yesterday. The bad news is that technically Astronomical Spring doesn't arrive until March 20th. Even though we've entered the period in which meteorologists consider the spring season, we still do, and likely will, see more cold and potential snow before April. The snow will likely be confined the mountains, if it snow occurs. We occasionally do see snow in the Piedmont well into March. The weather geek in me says cold yes, but another big snowstorm, probably not. We've seen enough snow this year. I don't know about you guys, but I'm looking forward to Cicadas buzzing, thick, green foliage along the river, bountiful terrestrial insects, and summer fishing. Once we start hearing the cicadas, summer is in full force. We've got a while though, so enjoy the occasional 70s and 80s we've seen thus far. By July you can tack on another 10-15 degrees to those numbers. While we are looking forward to consistently warmer weather, we should also be worried about the drought. So far, cold fronts have been our only source for rain. The cold front that moved through Monday dropped decent amounts across a good chunk of NC, but we still have a ways to go. We need to start racking up as much precip as we can. Once summer rolls around, the drought tends to get worse. Last summer I was fishing the South Toe River. 9 cfs at one point in July. Keep your fingers crossed we don't see a replay this summer. We probably will though, as history tells us summer is the season for low and warm water. If you venture out to the trout stream in the coming days, you won't be greeted with 70s for temperatures. We have transitioned back to normal temps in the 50s. Nymphs are working best right now, as are streamers. Trout will be feeding on what they can find below the surface more than what's on top. So far, I haven't heard of any major hatches, but it's just a matter of time. Quill Gordons and Blue Quills have been reported, but nothing substantial just yet. We'll see them first on the lower stretches of most waterways. With time, they'll hatch in the higher elevations as the water warms. Snow pack is nonexistent here in the Tar Heel State. That definitely helps when it comes to warming the streams up. Snow melt is of course very cold. It can significantly lower a stream's water temperature. Now that the snow is melted, we can anticipate the water warming with time. Lastly, if you are planning on attending Troutfest 2011 in Townsend, TN in mid May, you'll need to get lodging taken care of soon. Especially if you plan on staying in and around Townsend. Rooms go fast. If you aren't familiar with Troutfest, here's the scoop. Troutfest is one of the largest venues for fly anglers in the Southeast. The banquet is on Friday May 14th and the exposition is the 15th and 16th. 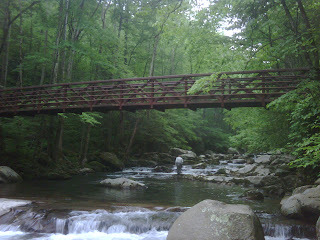 Troutfest and fishing in Great Smoky Mountains Nat'l Park is worth the trip for sure. I'll be at Troutfest, both as a tying demonstrator and spectator. Looking forward to it!